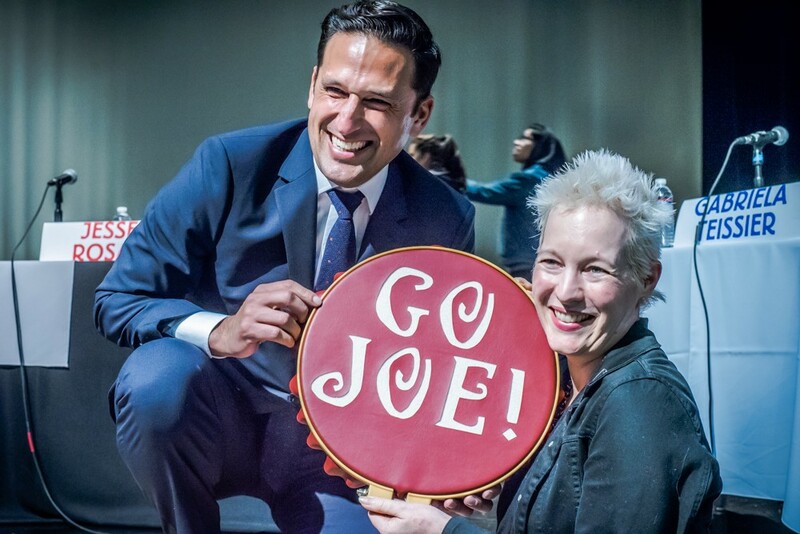 It wasn’t until December 2015 — when a city service truck struck and killed a teenage boy crossing Figueroa Street, a notoriously pedestrian-unfriendly stretch of road in northeast Los Angeles — that Joe Bray-Ali felt compelled to run for city council. Some blamed the death of the teen (who was the third pedestrian killed at that intersection since 2002) on Gil Cedillo, the councilman for the district, who a year earlier voted against a proposal to install lights, crosswalks and three miles of bike lanes on that very road. Bray-Ali ran a bike shop 2.5 miles up the road on Figueroa, and had been advocating for those safety measures for seven years. He even tried to engage Cedillo directly at one point, but says he was shuffled from staffer to staffer, and ultimately ignored. He’s standing in the living room of a large bungalow in Cypress Park, a neighborhood not far from that fateful bike crash. Clean-shaven and side-parted, he greets local residents in his slacks/sweater/collared-shirt combo, trying to convince them to unseat Cedillo and elect him instead. “I’m wearing my suburban dad sweater,” he deadpans. The look is a departure for Bray-Ali, who until just a few months ago was living the L.A. cool-dad dream. 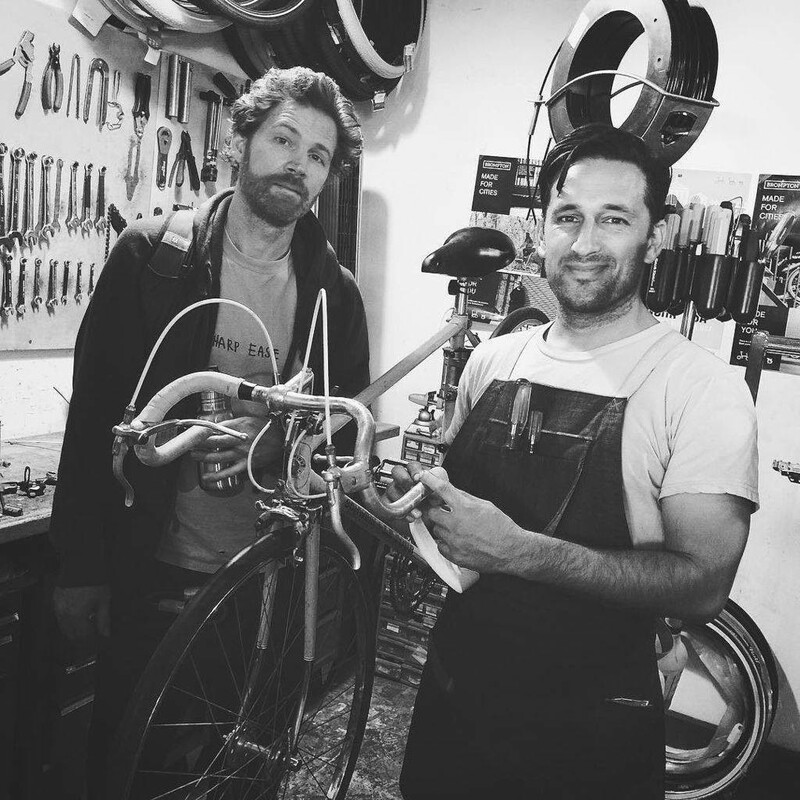 He owned his own bike shop, Flying Pigeon, and kept his hair long and his beard unkempt. But he literally sold out the boho lifestyle last spring, converting his shop warehouse into a campaign headquarters and liquidating his inventory to fund a campaign to represent L.A. City Council’s District 1, a wide swath of mostly Latino neighborhoods to the west and north of Downtown Los Angeles. To do so, he’ll have to convince the voters he can effectively maneuver the community’s housing and gentrification issues. He claims he can cater to both sides of the gentrification divide, simultaneously promoting the development of the area and ensuring lifelong residents don’t get displaced. His main platform: Bike lanes. More specifically, he envisions a community where biking, walking and public transit—not cars—are the most viable forms of transportation and where residents collectively own mid-density apartment buildings and rent out “granny flats” in their backyards. “There is a class battle between the educated professionals and the lower class. That resentment already exists,” Bray-Ali tells the dozen voters who have congregated to meet him. The rapid change has displaced long-term residents and sparked tensions for newcomers. “I don’t think starving artists are necessarily the culprits,” a white woman with kids in tow says halfway through Bray-Ali’s talk. Many of the meeting’s attendees can relate to getting pushed out of more expensive areas—like the 39-year-old dad who moved here three years ago after getting shut out of the housing market in more gentrified areas of District 1, or Bray-Ali himself, who left behind gentrification in Venice, where he grew up. Half Indian, half Hungarian and Irish, Bray-Ali “looks white,” as he tells the crowd, and he understands the poor “optics” of a white guy running for public office in a predominantly Latino neighborhood. But Bray-Ali says his personal history makes him uniquely qualified for the challenge — he knows firsthand what it’s like to lose your community to gentrification. He grew up middle-class, Unitarian and steeped in local politics. His father immigrated from India and worked in state and local politics for more than 25 years. His mother taught English as a second language at a community college. But when Bray-Ali returned to L.A. in 2003, after earning an anthropology degree at the University of California-Santa Barbara, he found the Venice of his youth full of “yuppies.” Now, the neighborhood is a poster child for the ill effects of gentrification: Properties rival the wealthiest parts of San Francisco and Silicon Valley in price and sit right next to tent villages for the homeless. “It wasn’t so much that I couldn’t afford a place to live, but I lost all the social connections I’d built up skating, surfing, being a member of the marching band and the swim team. All the friends I had, knowing their families their history, that was all washed away because a bunch of money flooded in,” Bray-Ali tells me. The displacement sent Bray-Ali into a “psychological wilderness,” he says. Disillusioned, he moved east from the beach to Highland Park, where he traded in surf-skate culture for mid-aughts bicycling enthusiasm. “I mean, I wasn’t gonna join a church,” he says. 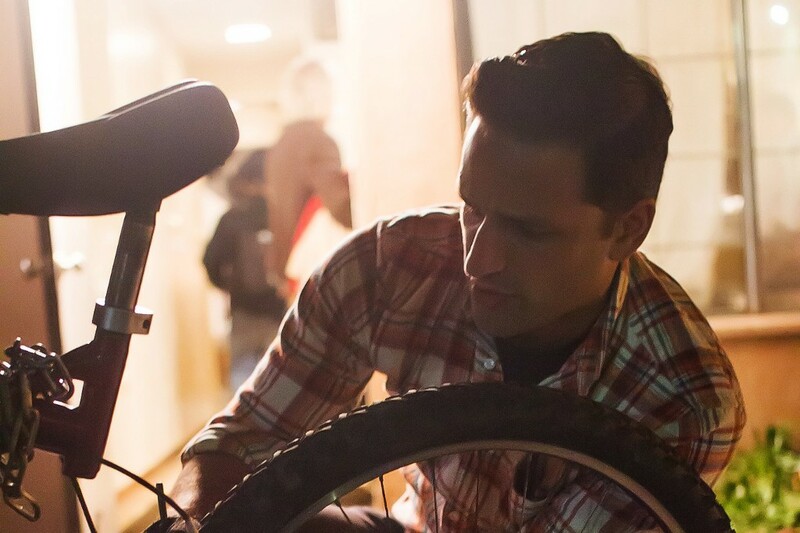 In 2005, he founded Bike Oven, a nonprofit co-op for fixing bikes, run out of his brother Adam’s garage. He also started to dabble in local politics, working as a field deputy for a state assembly candidate and serving on his neighborhood council. In 2008, he and his brother went pro with their hobby and opened Flying Pigeon, selling high-end Dutch cruisers for upwards of $1,400. Promoting biking as a daily mode of transportation was already a growing movement in other major metro areas. The number of people biking to work in New York, Chicago, Washington, D.C., San Francisco, Portland, Denver and Minneapolis more than tripled from 1990 to 2012. Paris established its own bike-share program in 2007, and Chicago and New York were planning to expand bike lanes and make biking a viable option for all residents. And Portland, long a trailblazer in urban biking, was changing its infrastructure to prioritize bikes over cars on many roads. But the Bray-Ali brothers were on the forefront of bike culture in Los Angeles, where it would be almost a decade until a bike-share program was established. “Most people aren’t as used to this idea of the bike as a durable good and a real, daily mode of transportation in L.A.,” Joe told the Los Angeles Times in 2009. At Flying Pigeon, Bray-Ali cemented his reputation as the unofficial mayor of northeast L.A.’s burgeoning bike scene, organizing group bike rides to local restaurants and talking with customers about the need for more bike lanes. “He’s known in the biking community, and he’ll help out anybody,” a young neighbor said at the time. More than anything, biking provided the sense of community he’d lost in Venice. In 2015, Councilman Cedillo voted against an infrastructure plan that included adding 300 miles of bike lanes, saying it would increase congestion. “The reality is Southern California is built around the automobile,” Cedillo told The New York Times before the vote. The plan passed anyway, but Cedillo maintains that bike lanes are broadly “unpopular,” despite the enthusiasm from a small but loud group of bike enthusiasts. Bray-Ali, for his part, claims most District 1 residents want improvements like more bike lanes, bus stops and parks. A more bikeable, walkable district — combined with rezoning spaces for recreational uses — will foster more interaction between residents, and perhaps help to alleviate the cultural strain between the gentrifiers and the gentrified. Cedillo has been a vocal proponent of real estate development, saying the best way to address the rising housing costs is to drastically increase supply to match demand. Bray-Ali agrees in theory — he and Cedillo both oppose Measure S, a ballot initiative to slow real estate development — but not execution. Instead of building large luxury high-rise apartment complexes, that attract wealthier Angelenos, and further displace existing residents, he wants mid-density housing (buildings three to five stories tall). These properties will increase housing supply in the neighborhood without turning it into a mini-Manhattan and affecting its charm. A major component of that plan is easing land-use restrictions on homeowners, allowing them to build so-called “granny flats” — one-bedroom apartments in their back yards. “Instead of one property with 1,000 units, you can have 1,000 properties with one unit,” Bray-Ali tells his audience. This resonates with the lone Latino man in the room, who complains the city recently stopped him from renting out rooms in his private residence. “Easing restrictions on accessory dwelling units can help, and they certainly can’t hurt,” Lindsay says. “It’s not the only solution to Southern California’s housing crisis, but it’s a solution.” A new study from economists at Harvard University and the University of Pennsylvania finds real estate prices in L.A. could be cut in half if development restrictions are lifted (although that conclusion includes high-density properties.) He also wants city subsidies for low-income residents to establish community trusts and collectively own the properties they live in. Bray-Ali finishes the event with handshakes and requests to donate time and money to his campaign, then walks the 1.5 blocks to his campaign center. Along the way, a woman spots him and stops her car so she can wish him good luck in the race. The interaction reminds him of the Venice of his youth.